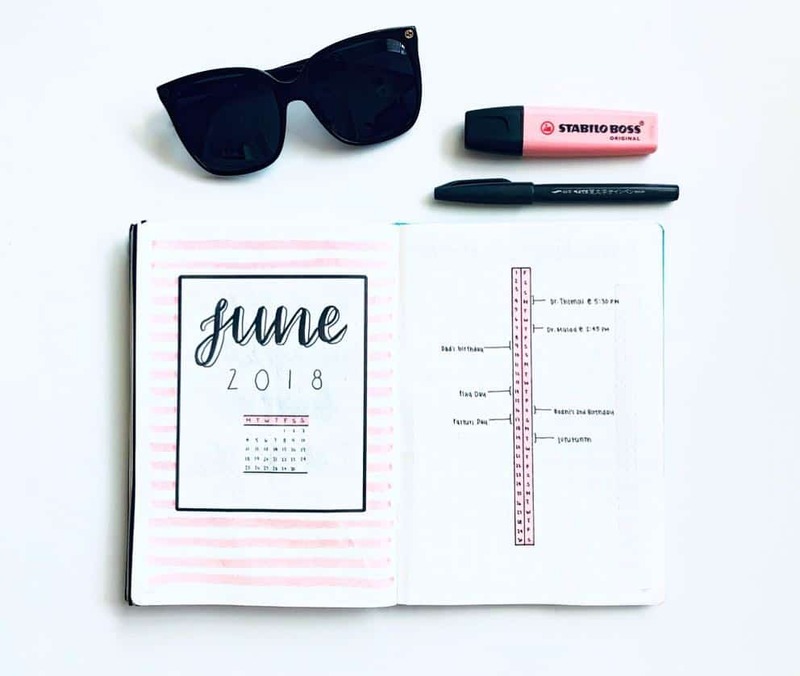 Erin is the quirky and creative mind behind The Petite Planner. 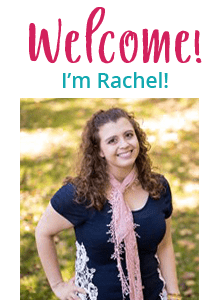 Over the last year and a half, Erin has been featured in 3 books and created 2 online creative journaling courses. Aside from being a doodle junkie and list enthusiast, she’s very active and outdoorsy. She, her soon to be husband, and two daughters live in the beautiful Big Sky Country, Bozeman, Montana, and try to spend as much time outside as possible. 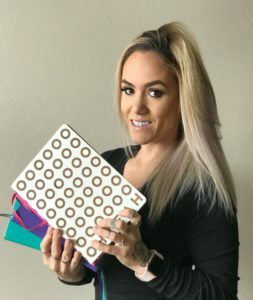 You can Follow Erin on Instagram, Facebook, Youtube, and Pinterest! 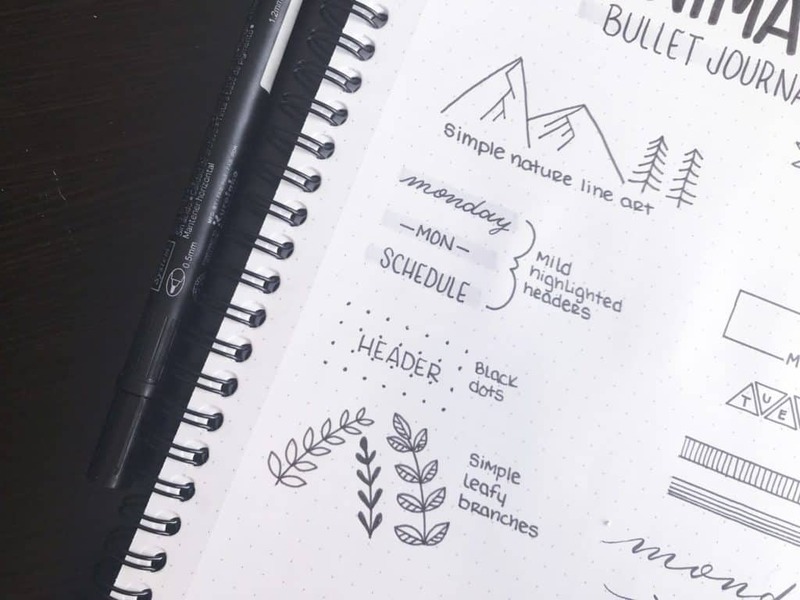 Browse through the #BulletJournal or #Bujo hashtags on Instagram and you’re likely to see countless intricate and highly decorated spreads. They’re beautiful and alluring. But, they aren’t for everyone. And for someone just starting out, these over the top spreads can be intimidating and make newbies shy away from trying the system. Personally, I tend to air on the side of creative, colorful, and blingy. I’ve also been using the bullet journal system for over two years and have found my balance. 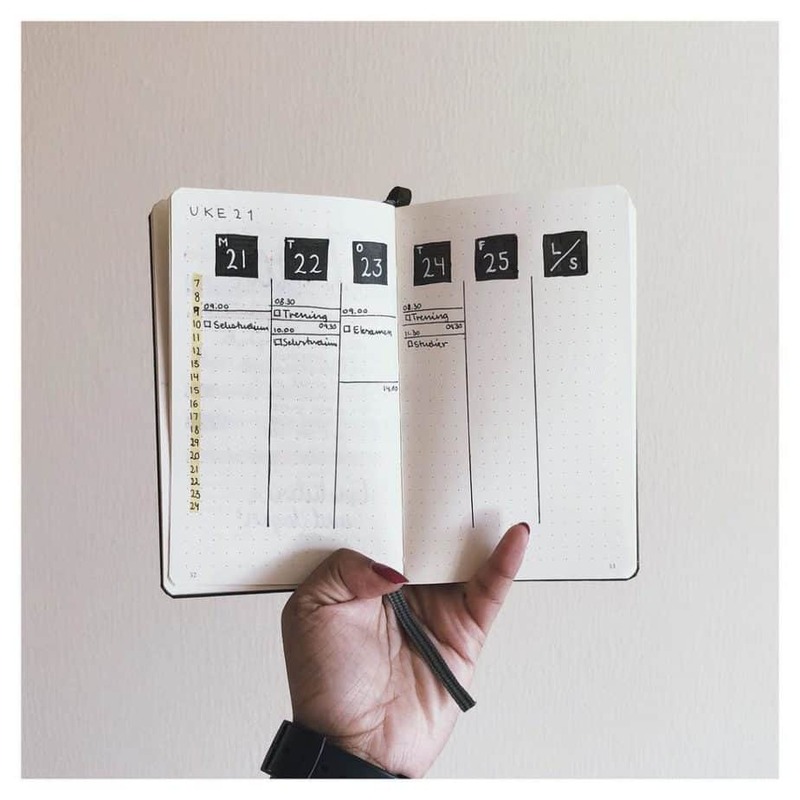 However, setting up these glamorous spreads is time-consuming and can sometimes defeat the purpose of the bullet journal system altogether. And every now and then I need to create a spread that’s quick and functional. But I generally still want to add a little decoration or a touch of creativity for the aesthetic element. 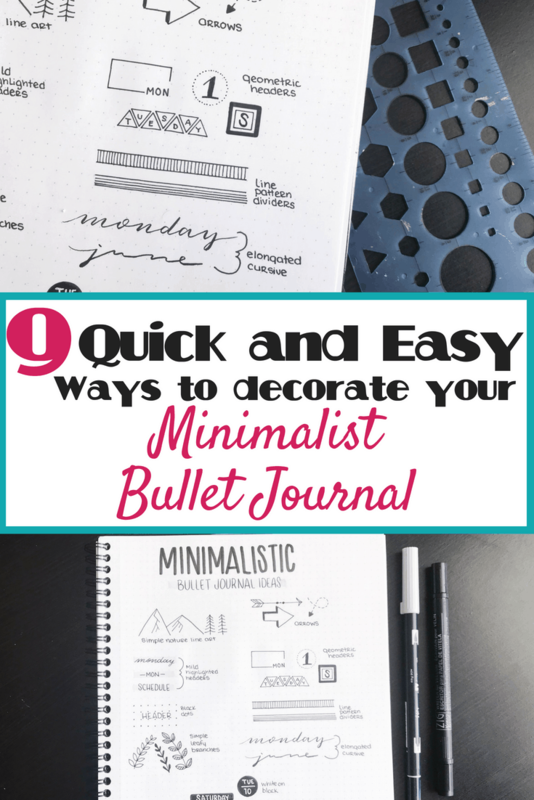 If you prefer a more simplistic or minimalist bullet journal but want to add a personal touch of creativity to your journal, this post will show you nine quick and easy ways to do so. You’ll also get some great inspiration from minimalist bullet journalists on Instagram at the end of this post. 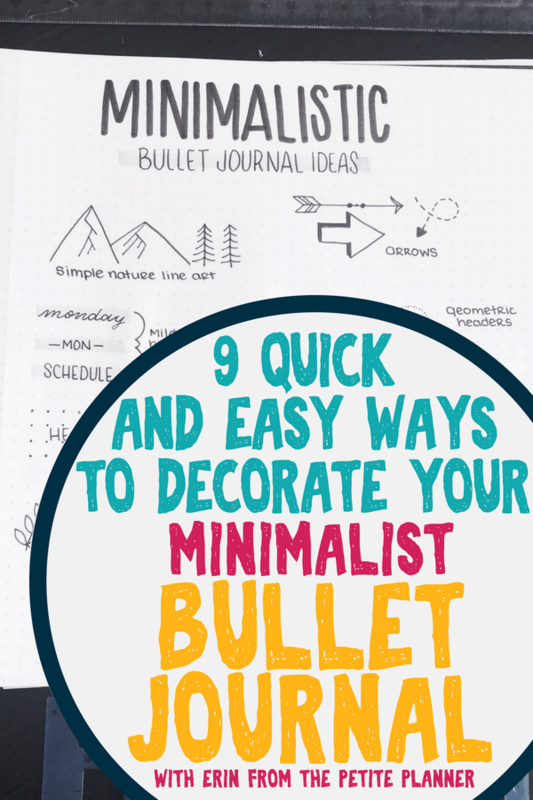 But first, what is classified as a minimalistic bullet journal? 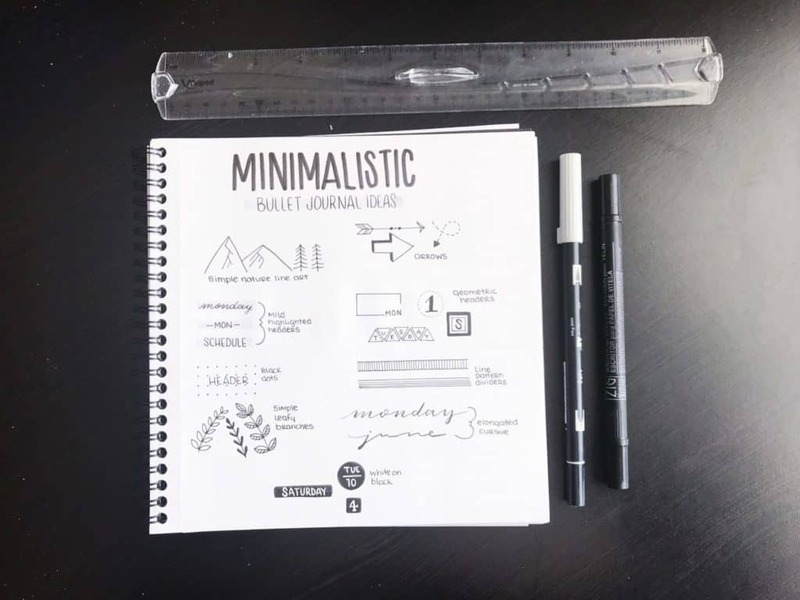 What Defines a Minimalist Bullet Journal? 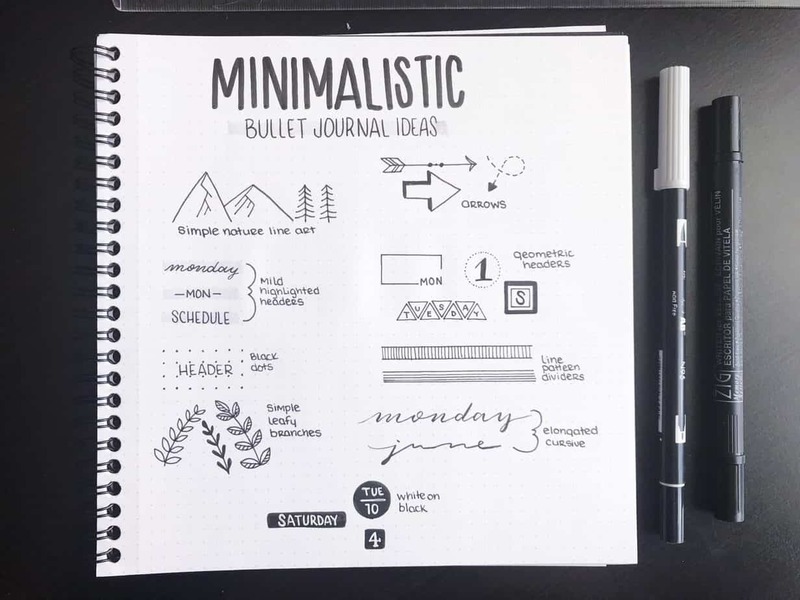 While Webster’s doesn’t have a definition for it and ultimately, minimalistic is a matter of perception, there are a few traits of minimalistic bullet journals. They are often monochromatic or use very little color. The most common color scheme is grayscale. They lack doodles and elaborate headers, borders, boxes, etc. Their main focus is productivity, organization, and record keeping in a clean and organized format. But, none of these are set in stone. You may fit one of the above statements and not the other two. You get to define what minimalistic is to you and work from there. 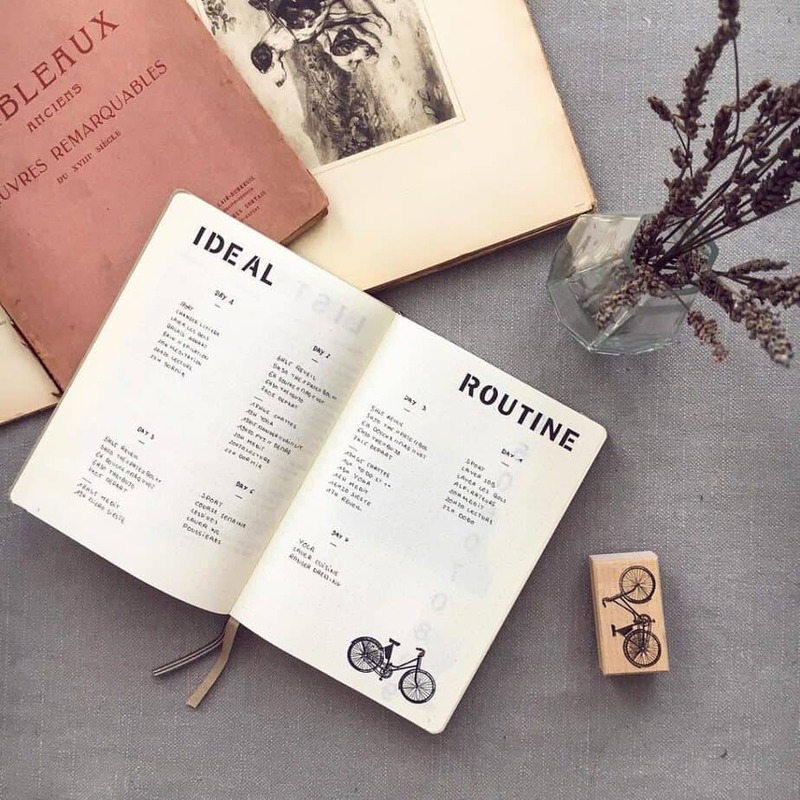 And that’s why I want to share with you a few design elements you can incorporate into your minimalistic bullet journal if you’d like. These design elements came to me in various ways. I’ve seen them used by other bullet journalists on Instagram and Pinterest. Some I use in my spreads regularly. And others were just thrown together with a little bit of creative time… and coffee. You are free to use these design elements in your own journal, revamp and redesign them, or dream up your own after seeing them. 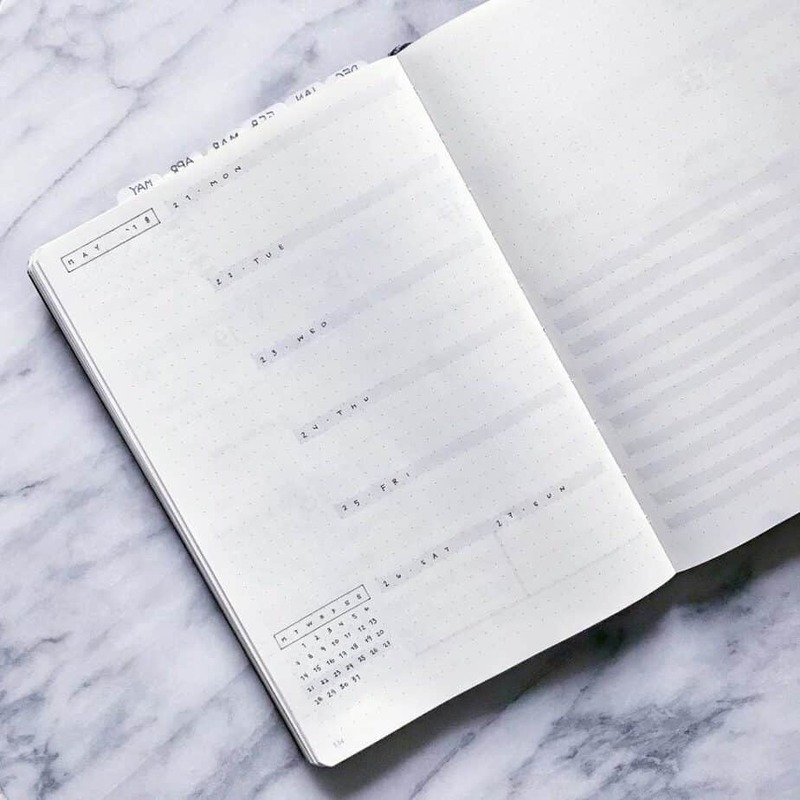 Whether you have experience with the bullet journal and have come to love the minimalistic setup or you are brand new to the system and looking to ease into it, these simple designs can work for you. There’s something about nature that melds so well with the minimalistic concept. Simple line art mountains, trees, or even clouds can change the aesthetic of a page in just a few minutes. To draw mountains, start by drawing a simple triangle, leaving the bottom open. Start your second triangle about half or one-third of the way up your first triangle. Continue with this pattern until you have as many mountains as you’d like. Then, add some jagged lines extending from the point of the triangle down to created ridges. Feel free to add some branch-like lines or diagonal lines for shading. Hey it’s Rachel, jumping in real quick! Mountains are a lot of fun to create and so easy, too! If you’d like to see a mountain theme in action, make sure to read my Plan with Me July 2018 post for more ideas and inspiration! Arrows are a great way to add direction or priority to a task or event. They also make great headers. There are a variety of arrows to choose from. The simplest is drawn with a straight horizontal line with a pointed triangle at one end and two quadrilaterals extending from the other end. You can also make dashed line arrows, block arrows, zigzag arrows, and so many more. 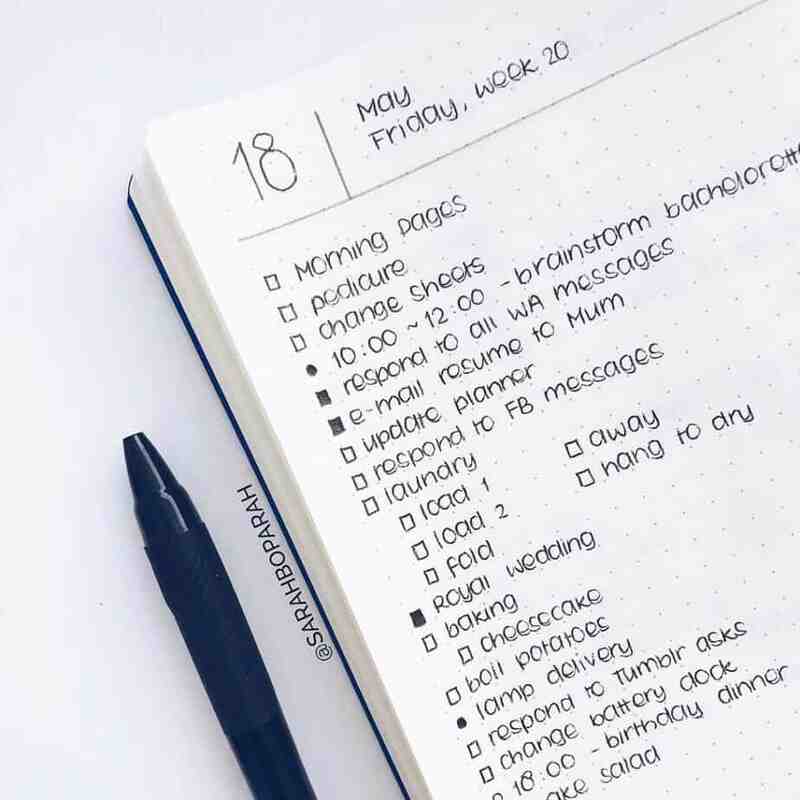 One of the most common and aesthetic ways to add some decoration to your minimalistic bullet journal is with highlighted headers. For a monochromatic look, choose a very light gray marker or highlighter. I love the look of the Gray Zebra Mildliner and the Tombow N95 (Cool Gray). This technique works best if you highlight first and then use a black pen to write over top. Doing it in this order will prevent the black ink from smudging. Geometric shapes are among my favorite minimalist bullet journal design elements. And with the help of a stencil like the Westcott Technical Drawing Template, creating these headers is quick and easy. Tip: Don’t connect the corner of your geometric shape. Instead, leave room to write your header. You can also try using varying widths of black pens to create contrast. 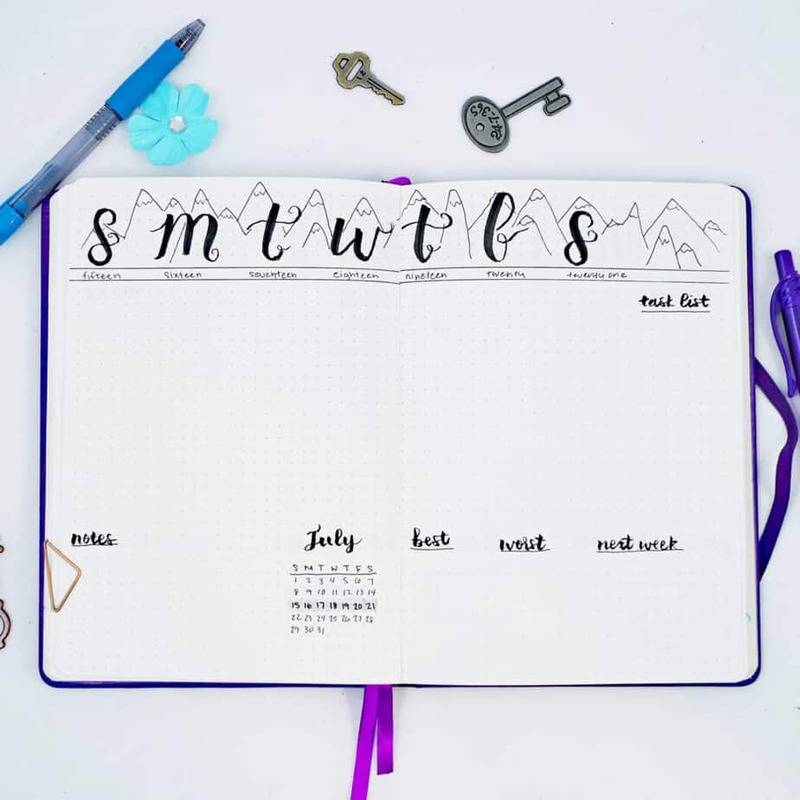 Want a quick way to add some contrast and symmetry to your weekly spreads, monthly cover pages, or collections? 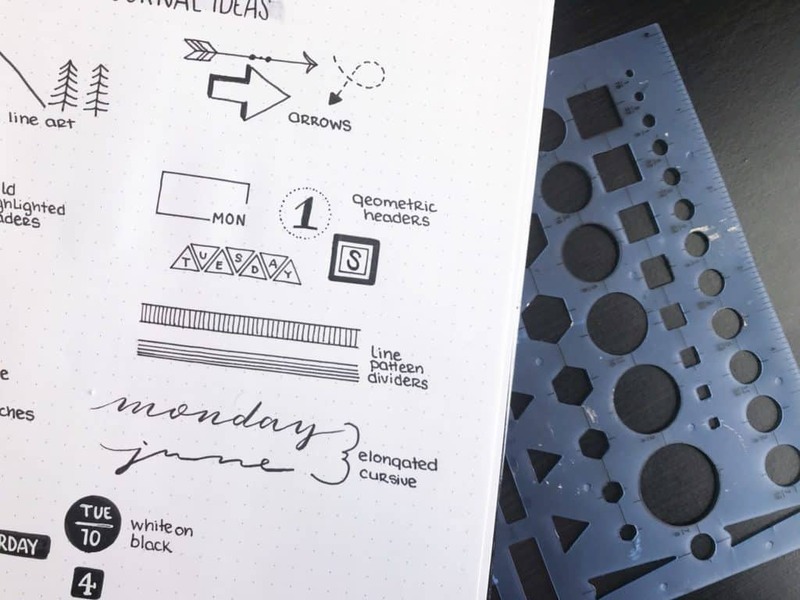 Try adding black dots on top of the printed dots in your journal. This technique is a great way to fill in empty space in a corner or around your header. Plus, it requires very little effort, creative skills, or time. 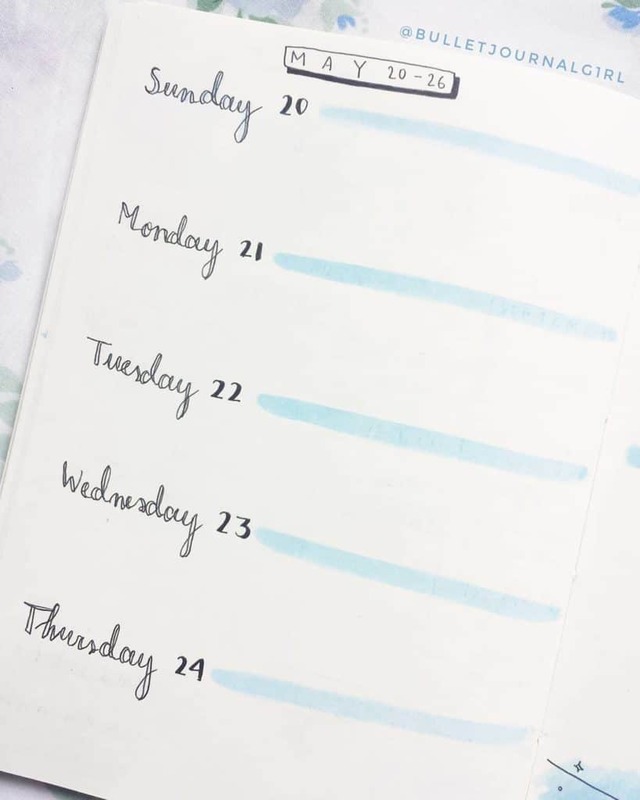 If you love the look of a clean weekly spread but need a little more structure between days, you can use a very simple line pattern divider. Creating these is simple. Start with two parallel horizontal lines. Then, use your black pen to fill in the space between the two lines with either horizontal or vertical lines. If you want to try something a bit more complex, use diagonal lines. These design elements stems back to #1. Nature and minimalism create a beautiful and harmonious composition. These stems are fairly easy to draw and look stunning around a header or in the corner of a spread. Start by drawing a slightly arched line. Then add raindrop or pointed oval shapes along both sides of the line. You can leave these hollow, fill them in with black ink, or add a simple line design to the interior of your leaves. For the best results, have multiple leafy branches extending from a header or create a laurel with two branches that touch at the bottom and extend up and out like a V-shape. This lettering technique can take your weekly headers from bland to beautiful in just a few simple strokes. Even if you aren’t 100% confident with your cursive, now is a great time to practice. You can do this with a regular ballpoint pen or a fine line pen when just beginning cursive. Once you have improved your skills, you can move onto a small brush pen like the Tombow Fudenosuke Pen or the Pentel Sign Brush Pen. To create the elongated effect, you’re going to start with highly angled cursive letters. The easiest method I have found for doing this is to rotate your page so that you are writing at an angle. Then, instead of pulling your pen up to create the next letter, extend the tail our horizontally at a slight upward angle. Then you can create your next letter. Play around with this technique. Making your letters shorter and shallower can add a softer effect. But you can also bounce your letters or do faux-calligraphy for a more dramatic effect. 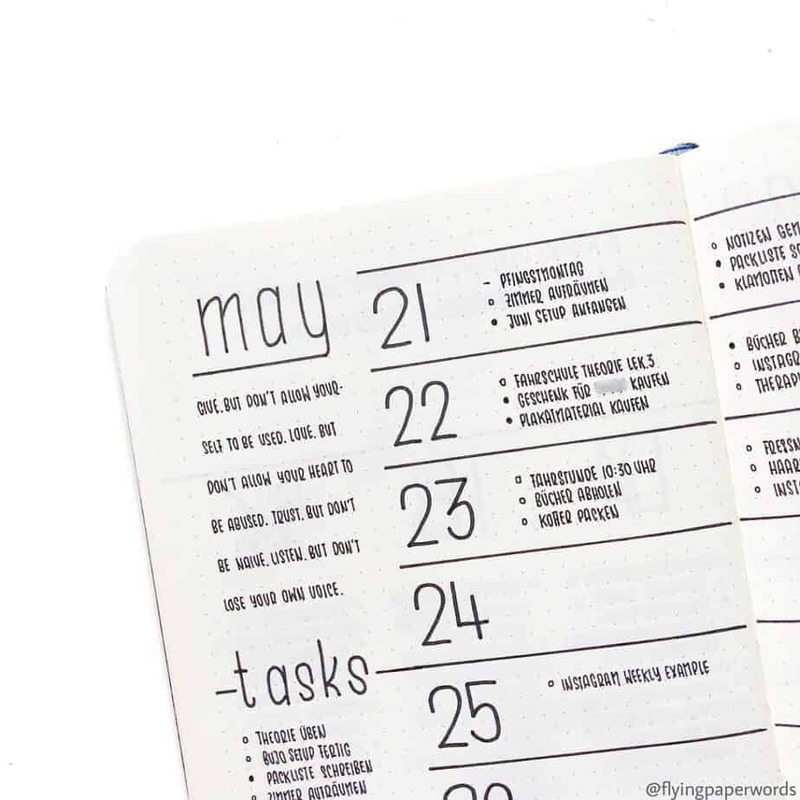 This is another of my favorite minimalist bullet journal design elements. Creating this effect is very quick and easy with the right tools. To create the black background you can use any pen or marker for your choosing. I love using the 1.5mm side of the Zig Memory System Writer combined with the shape stencil mentioned above. For the white writing, the Uni-Ball Signo White Pen is the ultimate white gel pen. It lays down opaque and is easy to write with. From here you can create a variety of headers and design elements, varying your font, the background shape, and the size. Need more inspiration? 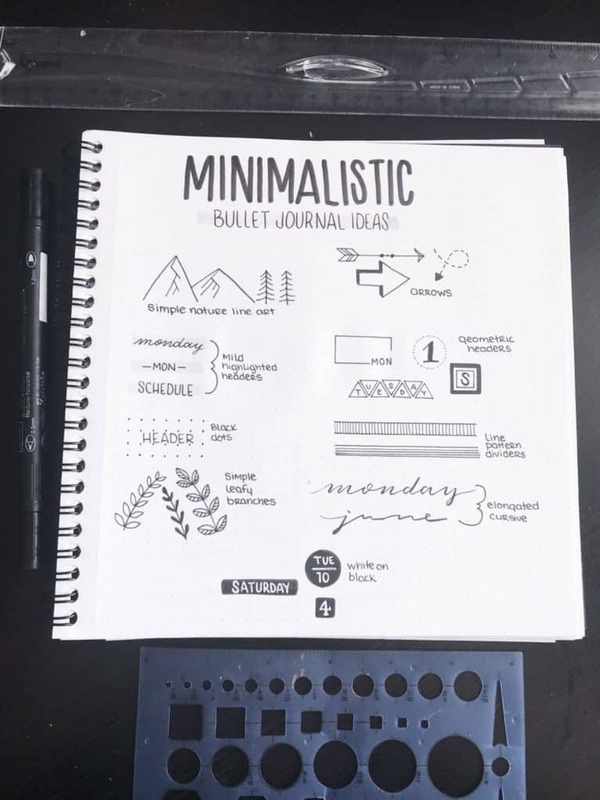 I’ve searched through Instagram to bring you some of the best minimalist bullet journal spreads I could find. Minimal lines, with a dash of gray. Straightforward, with a little art courtesy of a stamp! Simple, but classic daily to-do list. Structured, but still very minimalist! 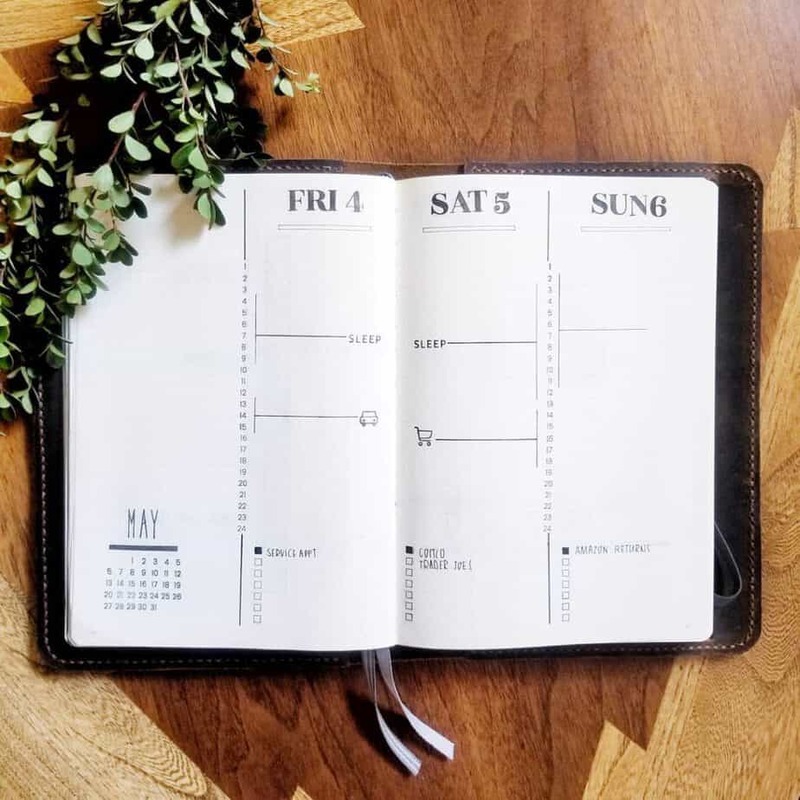 Stunning bullet journal spread filled with simplicity. The use of different size fonts gives this spread flair. Easy, minimalist spread with just a dash of blue. Minimalist with a little color! 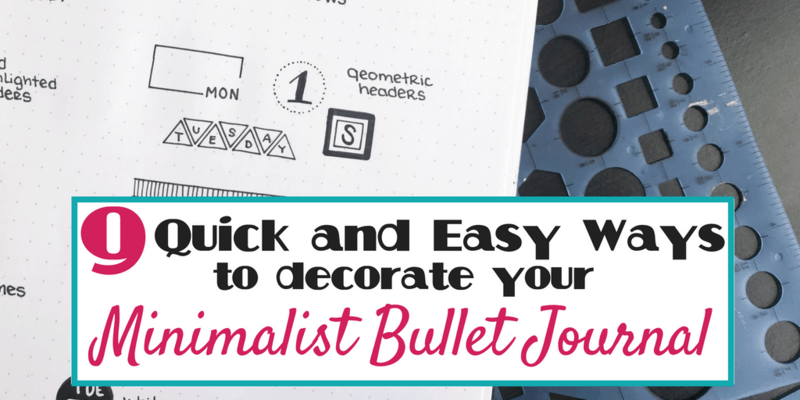 I hope this post gave you some inspiration for your own minimalist bullet journal spreads. If you use any of the above designs and are open to sharing them, I would love to see your work. You can tag me on Instagram. 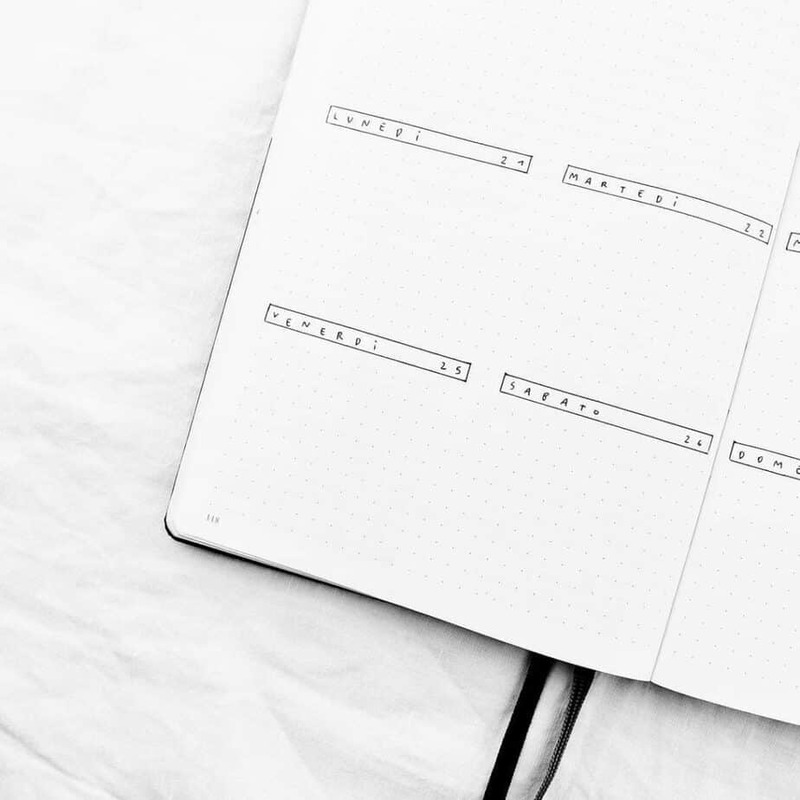 Did this inspire you to minimalist themes for your bujo?